Colgate University received a A+. Washington Monthly's ranking of 100 out of 224 of Affordable Elite Colleges - Overall Rank was a major contributor to this grade. "Colgate University has "snow-covered trees," "big limestone buildings," a vibrant party scene, high quality academics, and professors that cause students to gush with joy. Great liberal arts programs are plentiful here, and a core curriculum is required of all students regardless of major. Students are also "very involved" in athletics and "supportive" of Colgate's teams." What are the top 3 reasons someone should attend Colgate University? 1) All of the classes are taught by professors. 2) There are no graduate programs so 100% of available funding is on Undergraduate programs and facilities. 3) Colgate has an amazing graduate school acceptance rate. What is a typical Colgate University student like? Describe the type of person that should attend Colgate University. Colgate students and alum tend to be a tight knit community. Students are interested in a small school experience where faculty / staff and students can really get to know each other. Offers small town living, an active social scene, strong athletics, and close student/faculty interaction. Colgate maintains a good relationship with Hamilton, where most of the facility and staff live. Athletes, minorities, and legacies are among those who benefit from a more favorable review. It is a small liberal arts school that really feels like a community. Colgate is a nationally recognized liberal arts college set on a beautiful campus in central New York. Some 2,900 undergraduates pursue 52 majors, taking advantage of the university's award-winning curriculum, off-campus study program, and numerous research opportunities. Students enjoy small class sizes taught by expert faculty members -- not teaching assistants. The Center for Career Services helps students explore career options and thousands of connected and passionate alumni serve as important resources as seniors finalize post-Colgate plans. Colgate hums with activity. It is a place where the arts thrive. Student-athletes compete at the very highest level of NCAA Division I sports. There are dozens of club and intramural sports programs, and the college's outdoor education program is second to none. Above all, Colgate is about academic excellence. It is a tradition forged in 1819 and honed through the years by each class of select students. What are the top 3 things that students do for fun at Colgate University? Campus housing is available for undergraduates and is mandatory for freshman. Housing deposit : $500.00. Housing deposit due : May 1. Housing deposit is not refunded if student does not enroll.. Freshman allowed to have car. No pets. 92% of students live on-campus. 30% of male students live in fraternities. 32% of female students live in sororities. A program that focuses on the history, sociology, politics, culture, and economics of one or more of the American Indian, Aleut, Inuit, Hawaiian and other native peoples of the Americas from earliest times until the present, with particular emphasis on U.S. and Canadian populations and their problems but including reference to Caribbean and Latin American native peoples. Any instructional program in specifically defined area studies not listed above. A general program that combines the study of philosophy and religious studies. Includes instruction in logic; ethics; epistemology; symbolism; phenomenology; the sociology, psychology, philosophy, anthropology, literature, and art of religion; and world religions. A program that focuses on the history, society, politics, culture, and economics of the region encompassing Russia, Central Europe, Eastern Europe, and Eurasia, including the Balkan, Baltic, Caucasus, and Central Asian states that were republics of the former Soviet Union. A program that focuses on the cultures, environment, and history of the ancient Near East, Europe, and the Mediterranean basin from the perspective of the humanities and social sciences, including archaeology. A program that focuses on the theoretical and observational study of the structure, properties, and behavior of stars, star systems and clusters, stellar life cycles, and related phenomena. Includes instruction in cosmology, plasma kinetics, stellar physics, convolution and non-equilibrium radiation transfer theory, non-Euclidean geometries, mathematical modeling, galactic structure theory, and relativistic astronomy. 68% of students graduated in the top tenth of their class. The average student pays $22,038 for tuition, fees, and other expenses, after grants and scholarships. Total stated tuition is $46,060, in-state and on-campus, before financial aid. 41% of students receive some form of financial aid. 86% of students graduated on time. 90% of students graduated in six years. The typical (median) early career salary of Colgate University graduates is $51,800, according to Payscale. Colgate University participates in the NCAA Division I-AA for college athletics. 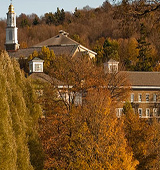 Want more info about Colgate University? Get free advice from education experts and Noodle community members. How can students get involved in Colgate University’s college town of Hamilton, NY?